Mitchell Kanashkevich is a travel photographer and very prolific author of photography-related e-books. Many of the have been reviewed here, on blog: portfolio-style “Journey through Java” and “Rabri”, and more technique and tips orineted “Captivating Color”. A few more will be coming soon. 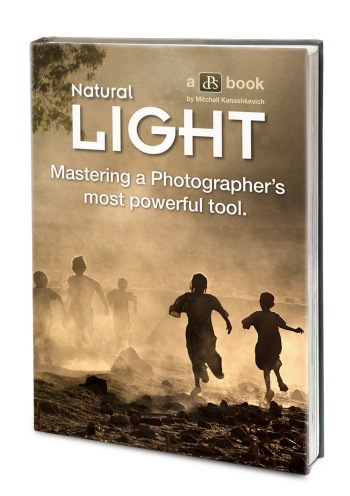 His latest e-book, “Natural light”, was released last week by DIgital Photography School. I consider myself a natural light photographer. I know a thing or two about using speed lights, but I prefer shooting outdoors and not limited by the weight of my gear. I was instantly interested when “Natural light. Mastering photographer’s most powerful tool” by Mitchell Kanashkevich came out. It is not yet another book about natural light, covering basic exposure rules, metering modes and use of reflector. I was very excited to see author’s own spin on one of the most popular book topics. “Natural light” consists of 96 double page spreads, divided into 7 clearly titled chapters (click on the image on the right to see larger version of the table of contents). It has a good combination of theoretical knowledge and practical tips and examples. The tips in the e-book on the same subject are referenced by clickable page links, the feature I found very useful. And all of it is illustrated with author’s own images from his travels to exotic places. I really enjoy his photographing style of creating often posed, yet totally natural looking shots. The minor complaint I might have, is while images are accompanied by the camera settings, they are missing the note on the place where they were taken. “Natural light” starts from explaining basics of exposure, including metering modes and use of histogram. The qualities of light are discussed, like intensity, color, angle etc., and how to approach working with often unpredictable and impossible to control natural light. There is also good introduction to post-processing techniques, including differences between global and local adjustments, basics of layers and HDR (High Dynamic Range). 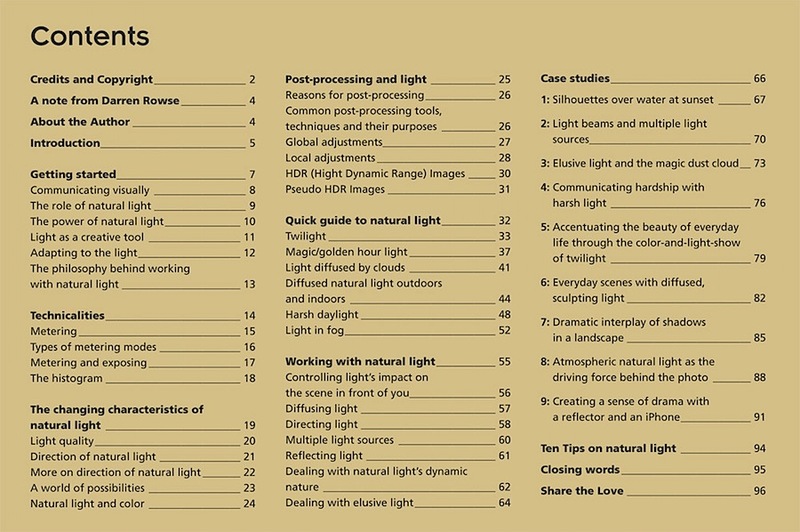 My favorite part of the “Natural light” is the guide to natural light. Mitchell Kanashkevich discusses each type of natural light, often changing with time of the day and weather, in every detail. He talks about the mood each light creates to suggest which stories might work best, the problems each type of natural light causes to photographers and how to overcome them. 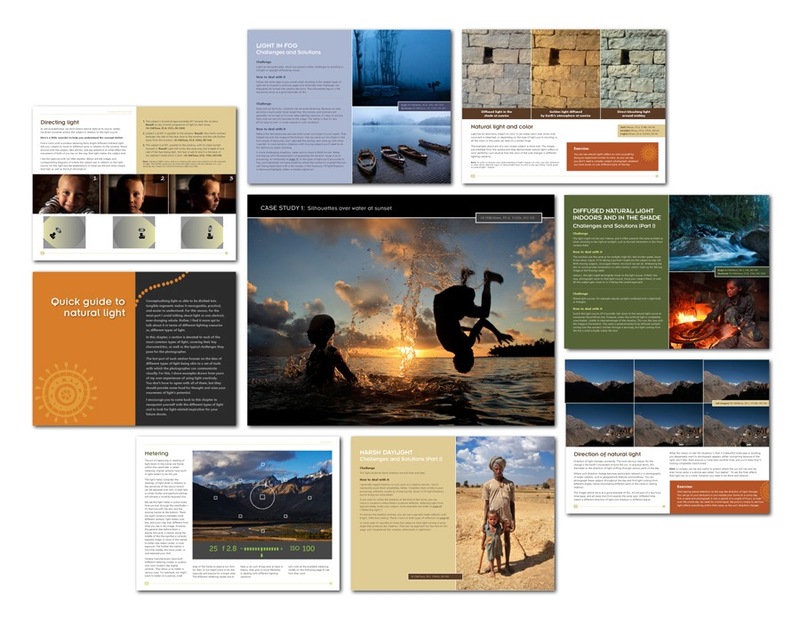 “Natural light” ends with 9 case studies. These are images discussed in great detail. The scene is analyzed for composition, technical and artistic decisions and, of course, for light. There is a wealth of practical knowledge hiding in those case studies. There is a lesson in the “Natural light” I have never seen anybody spell out before. While discussing different times of the day to shoot, Mitchell Kanashkevich is arguing against one of the photographic myths. He is not dismissing shooting in midday sun. Yes, the light is harsh, but in his opinion, it creates a unique mood, just like any other light. In the same way “golden hour” creates a certain mood by warm light falling delicately on the subject, the harsh shadows of the midday can help tell the story of, for example, hard living or working conditions. If you don’t believe it works, see the examples in the e-book! Another take home message from “Natural light” is to read the e-book, learn the lessons and then practice by observing the constanlty changing light as you go about your life. And note all the photgraphic possibilities of each light to be ready when you are out with your camera, looking for subjects. For the limited time, you can purchase “Natural light” by Mitchell Kanashkevich at a special, introductory price of $14.99. It is 25% off the regular price of $19.99! So if you feel this e-book is right for you, don’t wait! Click here to get your copy of “Natural light” today. The links in this post are affiliate links. See details of our affiliate policy here. 2 Responses to "Thursday read – endless possibilities to photographing with “Natural light” by Mitchell Kanashkevich"
Book looks awesome and is right up my ally.